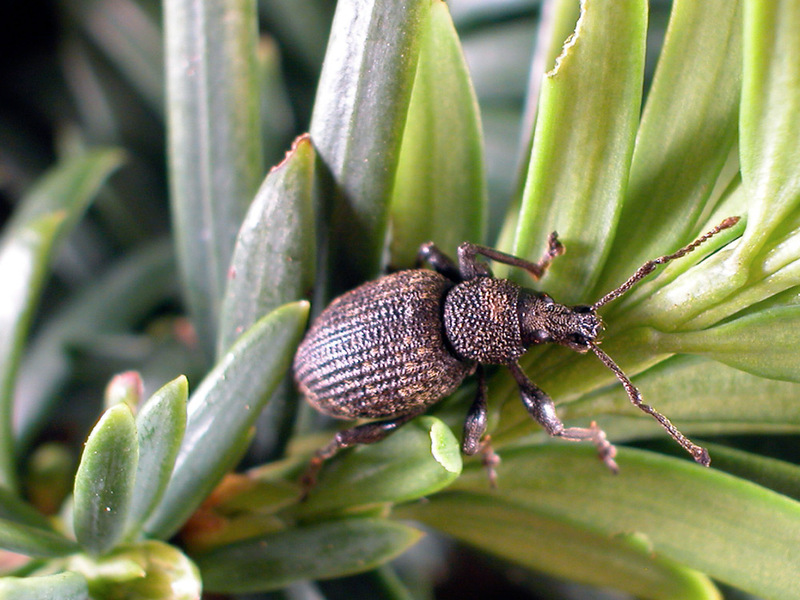 Signs- Irregular notches taken from the margins of the leaves are made by the adult weevil. If a plant suddenly dies and can be lifted easily having few or no roots, this is the work of the larvae. This is the way you usually find out that you have vine weevil larvae, by finding a poorly looking plant, going to pick off a dead leaf to find that the whole lot lifts from the roots in your hand. Adults may be seen around plants, look for cream / white larvae in compost when re-potting plants, if you find them, discard the compost and use new out of a bag. 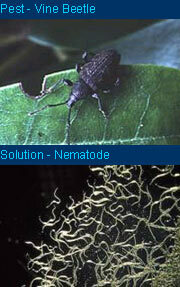 Damage- The worst damage is from the underground grubs which especially affect plants grown in containers. Growth will slow, the plant may then begin to wilt and finally die as it no longer has sufficient roots to sustain it. Unfortunately by the time it has been discovered it is usually to late to take steps for that plant, though others not so far gone can be protected. 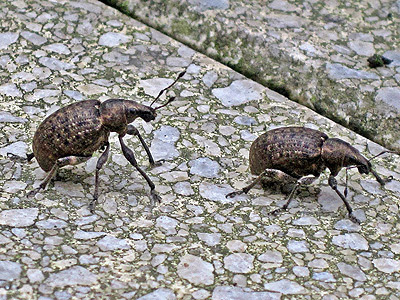 Treatment - Adult vine weevils cannot fly and are mainly nocturnal, during the day they burrow in the soil or live amongst fallen leaves and the like around plants and herein could lie their downfall. You can try leaving pieces of folded sacking or rolled up corrugated cardboard in likely spots and then the next day destroy them along with any caught vine weevils. In the longer term, good hygiene, clearing away fallen leaves and debris helps. To deal with the larvae is more difficult though there are now both chemical and organic means of doing so. Chemical killers against vine weevil larvae also have some effect against other pests that may be attacking the same plants. They are generally NOT recommended for edible crops and plants, fruit, vegetables or herbs and are just for use on ornamentals. Biological control uses tiny nematode worms which attack both the adults and the larvae in the soil, it is an organic approach and can be used on edible plants too. They work better on protected plants indoors or on containerized plants which fits just fine as these are the sorts of plants that are most often attacked by vine weevil larvae in particular. The nematodes come in powdered form and are watered on in late summer, while the soil is still warm but the grubs are, hopefully, still small enough not to have caused too much damage. I have a rather soft spot (ok maybe I'm weird) for adult vine weevils as I'm sure they're cartoon characters come to life with the long proboscis and antennae placed near the end. The best thing about them is that if you let them walk across your hand, their tiny claws (that you can't feel at all) mean that they just keep on walking irrespective of how much shaking about you do - try it it'll make you LOL :o) - well it does me.